It is not a secret that in Ugears we are passionate about mechanics, engineering, learning how things work and sharing our knowledge. What you might not have known – but surely started to guess by now – is that we are also dedicated board games lovers. We like the challenge and excitement of a game as much as we are fond of smart mechanisms. 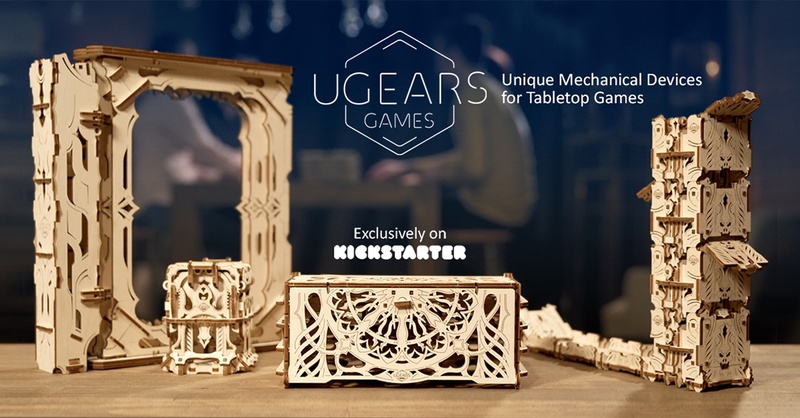 Due to these two strong interests, right now exclusively on Kickstarter we are happy to present the new Ugears Games collection, the series of unique functional wooden mechanical devices designed to handle, transport and store game elements in various tabletop games. The Card Holder, the Modular Dice Tower, The Deck Box, the Game Master’s Screen and the Dice Keeper will become the smart assistants in your tabletop games and wonderful presents to your fellow-gamers. Let’s play together. It’s time to make your move on Kickstarter! All our devices for tabletop games are the result of the Ugears engineering team’s collective imaginations. They are easy-to-build and fun to use and play with in your favorite games. The kits are made of high grade wooden materials and engineered for self-assembly. The Game Master’s Screen. Folded together, this unconventional looking device resembles a large book. Completely unfolded, it opens as a screen with 2, 3 or 4 panels with an easy cheat sheets (A4 or 8.5" x 11") replacement mechanism and a built-in dice-tower. Ugears is a young Ukrainian company established in 2014 with its own production facilities located in the outskirts of Kyiv. We invent, develop and produce unique modular mechanical models in which everything is real. Some of the designs are based on real-life prototypes while others represent an original re-imagining of historical mechanisms. Most of the models are propelled by a rubber band motor, system of gears, wheels, weights and gravity. Ugears is a team of over 190 inspired professionals: engineers, designers, and craftsmen who create unique models and devices made entirely out of wood. Ugears’ mission is to give an unforgettable time of working together on things that are popular for all ages. We want family members and friends to have fun bonding while creating. And as a result — to get revived mechanical marvels. Made from sustainable wooden materials each Ugears mechanical devices kit has all you need for assembly: a set of high-quality plywood boards with precisely cutout parts, full-color, detailed step by step, truly easy to follow instructions in 11 languages (Ukrainian, English, German, French, Polish, Spanish, Russian, Turkish, Italian, Chinese and Korean) and several spare parts inside. No glue and special tools are needed for putting a device together. You can assemble it at home on the table. Fits together like a puzzle without glue or special tools or even toothpicks thanks to Ugears’ patented joints. The Ugears device kits have certificates of compliance with health and safety regulations. Ugears models became a favorite hobby for people in 85 countries across 5 continents, and we care deeply about the great support, priceless feedback, and kind advice we have received from all of them. We believe that crowdfunding is the best way to expand the audience interested in these innovative products. Help us to spread the word and share it with your friends and join us in bringing these unforgettable moments of creation and positive thinking to people of all ages!